Viking refers to a member of the Scandinavian seafaring traders, warriors and pirates who raided and colonized wide areas of Europe from the late eighth century to the eleventh century. These Norsemen (literally, men from the north) used their famed longships to travel as far east as Constantinople and the Volga River in Russia, and as far west as Newfoundland. This period of Viking expansion is commonly referred to as the Viking Age of Scandinavian History. The territory they governed or controlled by way of such taxes as the Danegeld represent an early example of imperialism in the post-Roman Empire European space. In the main remembered for their ferocity and pillaging raids, the voyages of the Vikings also linked different parts of the world together within what was at least a partially shared culture and engaged in trade and commerce on a wide scale. The word Viking was introduced to the English language with romantic connotations in the eighteenth century. However, etymologists trace the word to Anglo-Frankish writers, who referred to "víkingr" as "one who set about to raid and pillage," as in the Saga of Egil Skallagrimsson. In Old Norse, the víkingr, were men from the Vik. Viken was the old name of the region bordering on the Skagerrak, from where the first Norse merchant-warriors originated. The Swedish county bordering on the Skagerrak, which is now called Bohuslän, was, prior to the construction of the Bohus fortress, also called Vikland. Vikland was once a part of the Norse district of Viken. Later on, the term, Viking, became synonymous with "naval expedition" or "naval raid," and a víking was a member of such expeditions. In current Scandinavian languages, the term Viking is applied to the people who went away on Viking expeditions, be it for raiding or trading. The word Væringjar itself is regarded in Scandinavia as of Old Norse origin, cognate with the Old English Færgenga (literally, an expedition-goer or rover). A second etymology suggested that the term is derived from Old English, wíc, i.e., "trading city" (cognate to Latin vicus, "village"). In Old English, the word wicing appears first in the Anglo-Saxon poem, Widsith, which probably dates from the ninth century. In Old English, and in the writings of Adam von Bremen(- d. 1081), the term refers to a pirate. Regardless of its possible origins, the word was used more as a verb than as a noun, and connoted an activity and not a distinct group of individuals. To "go Viking" was distinctly different from Norse seaborne missions of trade and commerce. Another etymology suggests that it refers to the descendants or people of Sheaf (Sceafa or Sceaf) a ruler of the Lombards who appears in the Old English poem Widsith. According to this theory, the term Viking comes from the Estonian word vihk meaning "sheaf" and the suffix ing meaning "son of, descendant of, people of, or subjects of." In English and many other languages, Viking may also have been used to refer to Viking Age Scandinavians in general. For example the traders and raiders of the era that originated from the eastern coast of the Baltic sea were first mentioned in the Icelandic sagas as the Estonian vikings (Norwegian:Vikinger fra Estland). The word disappeared in Middle English, and was reintroduced as Viking during eighteenth century Romanticism (the "Viking revival"), with heroic overtones of "barbarian warrior" or noble savage. During the twentieth century, the meaning of the term was expanded to refer not only to the raiders, but also to the entire period; it is now, somewhat confusingly, used as a noun both in the original meaning of raiders, warriors or navigators, and to refer to the Scandinavian population in general. As an adjective, the word is used in expressions like "Viking age," "Viking culture," "Viking colony," etc., generally referring to medieval Scandinavia. The Gokstad Viking ship on display in Oslo, Norway. The period from the earliest recorded raids in the 790s until the Norman Conquest of England in 1066 is commonly known as the Viking Age of Scandinavian History. The Normans, however, were descended from Danes, Norwegian (in Norwegian they are still to date referred to as jeg er en Normann), Orkney, Hiberno-Norse, and Danelaw Vikings who were given feudal overlordship of areas in northern France—the Duchy of Normandy—in the eighth century. In that respect, the Vikings continued to have an influence in northern Europe. Likewise, King Harold Godwinson, the last Anglo-Saxon king of England who was killed during the Norman invasion in 1066, was descended from Danish Vikings. Many of the medieval kings of Norway and Denmark were married to English and Scottish royalty and Viking forces were often a factor in dynastic disputes prior to 1066. 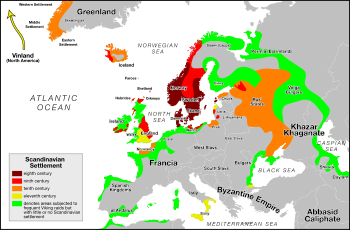 Geographically, a "Viking Age" may be assigned not only to Scandinavian lands (modern Denmark, Norway and Sweden), but also to territories under North Germanic dominance, mainly the Danelaw, which replaced the powerful English kingdom of Northumbria and the Isle of Man. 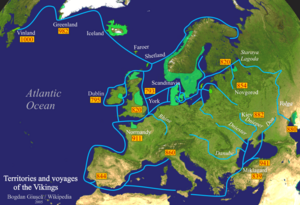 Viking navigators opened the road to new lands to the north, west and east, resulting in the foundation of independent kingdoms in the Shetland, Orkney, and Faroe Islands, Iceland, Greenland, and L'Anse aux Meadows, a short-lived settlement in Newfoundland, circa 1000 C.E. Many of these lands, specifically Greenland and Iceland, were likely discovered by sailors blown off course. Greenland was later abandoned because its few "green" spots disappeared due to climate change. Vikings also seized and destroyed many villages and territories in Slavic-dominated areas of Eastern Europe. The Persian traveler Ibn Rustah (tenth century) described how Swedish Vikings, the Rus, terrorized and enslaved the Slavs. From 839, Varangian mercenaries in the service of the Byzantine Empire, notably Harald Hardrada, campaigned in North Africa, Jerusalem, and other places in the Middle East. Important trading ports during the period include Birka, Hedeby, Kaupang, Jorvik, Staraya Ladoga, Novgorod and Kiev. There is archaeological evidence (coins) that the Vikings reached the city of Baghdad, the center of the Islamic Empire and their considerable intellectual endeavors. In 921, Ibn Fadlan was sent as emissary on behalf of the Caliph of Baghdad to the iltäbär (vassal-king under the Khazars) of the Volga Bulgaria, Almış. The Bolgar King had petitioned to the Caliph to establish relations. He had asked to have someone come to teach him Arabic and the Qur'an and pledge allegiance to Hanafi rite of the Sunni Muslims. The Caliph promised to send money to build a fort on the Volga, but the transaction never occurred. The Norse regularly plied the Volga with their trade goods: furs, tusks, seal fat to seal boats and slaves (notably female slaves; this was the one time in the history of the slave-trade when females were priced higher than males). However, they were far less successful in establishing settlements in the Middle East, due to the more centralized Islamic power, namely of the Umayyad and, later, Abbasid empires. A rich source of knowledge of these Scandanavian adventurers was written by Ibn Fadman, whose tenth-century Risala (Letter) gives vivid details of their workings. Generally speaking, the Norwegians expanded to the north and west to places such as Iceland and Greenland, the Danes to England and France, settling in the Danelaw (northern England) and Normandy, and the Swedes to the east. These nations, although distinct, were similar in culture, especially language. The names of Scandinavian kings are known only for the later part of the Viking Age, and only after the end of the Viking Age did the separate kingdoms acquire a distinct identity as nations, which went hand in hand with their Roman Catholicization. Thus the end of the Viking Age for the Scandinavians also marks the start of their relatively brief Middle Ages. Map showing area of Scandinavian settlement in the eighth (dark red), ninth (red), tenth (orange) and eleventh (yellow) centuries. Green denotes areas subjected to frequent Viking raids. The Vikings reached south to North Africa and east to Russia and Constantinople, as looters, traders, or mercenaries, known as Varangians. Vikings under Leif Eriksson, heir to Erik the Red, reached North America, with putative expeditions to present-day Canada, Maine and Southeastern Massachusetts, including Cape Cod in the tenth century. Traditionally, the earliest date given for a Viking raid is 787 when, according to the Anglo-Saxon Chronicle, three ships from Norway sailed to Portland Bay, in Dorset. There, they were mistaken for merchants by a royal official, and they murdered him when he tried to get them to accompany him to the king's manor to pay a trading tax on their goods. The next recorded attack, dated June 8, 793, was on the Christian monastery on the island of Lindisfarne, off the east coast of England. The resident monks were killed, thrown into the sea to drown or carried away as slaves along with some of the church treasures. After repeated Viking raids, the monks fled Lindisfarne in 875 C.E., carrying the relics of Saint Cuthbert with them. In 840 and 841, Norwegians raided during the winter months instead of summer, as was their usual tactic. They waited on an island off Ireland. In 865 a large army of Danish Vikings, supposedly led by Ivar, Halfdan and Guthrum arrived in East Anglia. They proceeded to cross England into Northumbria and captured York (Jorvik), where some settled as farmers. 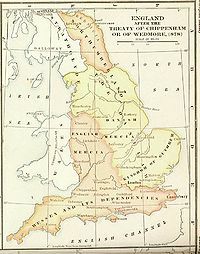 Most of the English kingdoms, being in turmoil, could not stand against the Vikings, but Alfred of Wessex managed to keep the Vikings out of his county. Alfred and his successors were able to drive back the Viking frontier and retake York. A new wave of Vikings appeared in England in 947 when Erik Bloodaxe captured York. The Viking presence continued through the reign of Canute the Great (1016-1035), after which a series of inheritance arguments weakened the family reign. The Viking presence dwindled until 1066, when the Norwegians lost their final battle with the English. The Vikings did not get everything their way. In one instance in England, a small Viking fleet attacked a rich monastery at Jarrow. The Vikings were met with stronger resistance than they expected: their leaders were killed, the raiders escaped, only to have their ships beached at Tynemouth and the crews killed by locals. This was one of the last raids on England for about 40 years. The Vikings instead focused on Ireland and Scotland. There was a good deal of intermarriage between the Vikings and the Anglo-Saxons. While there are few records from the earliest period, it is believed that Scandinavian presence in Scotland increased in the 830s. In 836, a large Viking force believed to be Norwegian invaded the Earn valley and Tay valley which were central to the Pictish kingdom.Pictish They slaughtered Eoganan, king of the Picts, and his brother, the vassal king of the Scots. They also killed many members of the Pictish aristocracy. The sophisticated kingdom that had been built fell apart, as did the Pictish leadership. In the confusion and terror caused by the ferocious ninth century Viking raids, the Pictish kingship was almost completely destroyed. Wrad, a Pictish warlord, eventually became King of the Picts at the same time as Kenneth became King of Dal Riata. The foundation of Scotland under Kenneth MacAlpin is traditionally attributed to the aftermath of this event. The isles to the north and west of Scotland were heavily colonized by Norwegian Vikings. Shetland, Orkney, the Western Isles, Caithness and Sutherland were under Norse control, sometimes as fiefs under the King of Norway and other times as separate entities. Shetland and Orkney were the last of these to be incorporated into Scotland in as late as 1468. As well as Orkney and Shetland, Caithness and Sutherland, the Norse settled in the Hebrides. The west coast was also heavily settled, and Galloway, which got its name from the Gall-Gael or Foreigner Gael (as the mixed Norse Scots were known). In 722, the Cornish allied with Danish Vikings in order to hold Wessex from expanding into Cornwall. A Wessex Saxon army led by King Ine was comprehensively destroyed by an alliance of Cornish and Vikings near the Camel estuary at "Hehil," possibly somewhere near modern day Padstow. This battle, recorded in the Analies Cambria, as well as the Vikings continual attacks on Wessex, enabled Cornwall to stay autonomous from Wessex for the next 100 years. 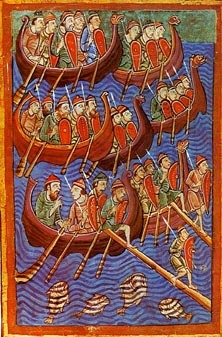 The Danes provided tactical support to their Cornish allies by making devastating pillaging raids on Wessex which weakened the authority of the Saxons, and in 1013 Wessex was conquered by the Danes under the leadership of the Viking King of Denmark Sweyn Forkbeard. The Vikings were defeated in late-twelfth century. Wales was not colonized by the Vikings as heavily as eastern England and Ireland. The Vikings did, however, settle in the south around St. David's, Haverfordwest, and Gower, among other places. Place names such as Skokholm, Skomer, and Swansea remain as evidence of the Norse settlement. The Vikings, however, were not able to set up a Viking state or control Wales, owing to the powerful forces of Welsh kings, and, unlike in Scotland, the aristocracy was relatively unharmed. Nevertheless, following the successful Viking alliances with Cornwall in 722 and Brittany in 865, the Britons made their peace with the Danes, and a Viking/Welsh alliance in 878 defeated an Anglo-Saxon army from Mercia, although there were still some occasional skirmishes between the Britons of Wales and the Danes. Until recently, Wales was not thought to have significant Viking heritage, but the high number of coastal towns/villages in Wales with old Norse names, especially compared to the coastlines of the Home Counties, East Anglia or South-East England has meant that the Viking settlement in Wales is considered quite prominent - certainly on the coast. The most significant Viking town in Wales is Swansea, which was founded by the imperialist Viking King of Denmark Sweyn Forkbeard who by 1013 was King of the Danes, Anglo-Saxons and Norwegians. Swansea is a corruption of the Norse "Sweyn's Ey," which means "Sweyn's island." The island refers to the area around the estuary of the river Tawe. The neighboring Gower Peninsula has many place names of Norse origin (such as Worms Head; worm is the Norse word for dragon, as the Vikings believed that the serpent-shaped island was a sleeping dragon). Twenty miles (32 km) west of Cardiff on the Vale of Glamorgan coast is the semi-flooded island of Tusker Rock, which takes its name from Tuska, the Viking whose people semi-colonized the fertile lands of the Vale of Glamorgan. The Danes made significant settlements on the coastal lowlands of Wales, such as Glamorgan, Gower and South Pembrokeshire, and in total contrast to the Anglo-Saxons of Mercia and Wessex, by the middle-to-end of the Viking Age, the Danes and Britons managed to live peacefully alongside each other, and like the Britons, the Danes were loath to give up their new territory in Wales to the Saxons without a fight, and ultimately, the Saxons were unable to conquer Wales, partly as in 1013 the Saxons were themselves conquered by the Vikings and annexed to a Danish empire controlled by King Canute. The Vikings conducted extensive raids in Ireland and founded many towns, including Dublin, Limerick, Mullingar, Wexford, Waterford and Leixlip. Literature, crafts, and decorative styles in Ireland and the British Isles reflected Scandinavian culture. Vikings traded at Irish markets in Dublin. Excavations found imported fabrics from England, Byzantium, Persia, and central Asia. Dublin became so crowded by the eleventh century that houses were constructed outside the town walls. The Vikings pillaged monasteries on Ireland’s west coast in 795, and then spread out to cover the rest of the coastline. The north and east of the island were most affected. During the first 40 years, the raids were conducted by small, mobile Viking groups. From 830 on, the groups consisted of large fleets of Viking ships. From 840, the Vikings began establishing permanent bases at the coasts. Dublin was the most significant settlement in the long term. The Irish became accustomed to the Viking presence and culture. In some cases they became allies and also intermarried throughout all of Ireland. In 832, a Viking fleet of about 120 ships under Turgesius invaded kingdoms on Ireland’s northern and eastern coasts. Some believe that the increased number of invaders coincided with Scandinavian leaders’ desires to control the profitable raids on the western shores of Ireland. During the mid-830s, raids began to push deeper into Ireland. Navigable waterways made this deeper penetration possible. After 840, the Vikings had several bases in strategic locations throughout Ireland. In 838, a small Viking fleet entered the River Liffey in eastern Ireland, probably led by the chieftain Saxolb (Soxulfr) who was killed later that year. The Vikings set up a base to enclose their Viking ships, which the Irish called longphorts. This longphort would eventually become Dublin. After this interaction, the Irish experienced Viking forces for about 40 years. The Vikings also established longphorts in Cork, Limerick, Waterford, and Wexford. The Vikings were driven out of Ireland for a short period around 900, but returned to Waterford in 914 to found what would become Ireland's first city. The other longphorts were soon re-occupied and developed into cities and towns. The last major battle involving Vikings was the Battle of Clontarf in 1014, in which a large force from the pan-Viking world and their Irish allies opposed Brian Boru, then the High King of Ireland and his forces, a small contingent of which were Viking defectors. The battle was fought in what is the now Dublin suburb of Clontarf on Good Friday of that year. Boru, the Irish High King had gracefully allowed the Viking King of Dublin; Sigtrygg Silkbeard, one year to prepare for his coming assault. Silkbeard responded by offering the bed of his mother to several Viking lords from Scandinavia and the British Isles. The savage melee between the heavily mailed Norse and the unarmored, yet undaunted Gaels ended in a rout of the Vikings and their Irish allies. Careful accounts were taken by both sides during the battle, and thus many famous warriors sought each other out for personal combat and glory. High King Brian, who was nearly 80 years old, did not personally engage in the battle but retired to his tent where he spent the day in quiet prayer. The Viking Earl Brodir of Man chanced upon Brian's tent as he fled the field. He and a few followers seized the opportunity, and surprised the High King, killing the aged Brian before being captured. Brian's foster son Wolf the Quarrelsome later tracked down and dispatched Brodir by disembowelment; Wolf watching as Brodir marched and wound his own innards around the trunk of a large tree. The battle was fairly matched for most of the day and each side had great respect for the prowess of the other; however, in the end, the Irish forced the Norse to return to the sea. Many of the fleeing Vikings were drowned in the surf due to their heavy mail coats as they struggled for the safety of their longships; others were pursued and slain further inland. After the battle, Viking power was broken in Ireland forever, though many settled Norse remained in the cities and prospered greatly with the Irish through trade. With Brian dead, Ireland returned to the fractured kingdom it had once been, but was now cleared of further Viking predation. West Francia suffered more severely than East Francia during the Viking raids of the ninth century. The reign of Charles the Bald, coincided with some of the worst of these raids, though he did take action by the Edict of Pistres of 864 to secure a standing army of cavalry under royal control to be called upon at all times when necessary to fend off the invaders. He also ordered the building of fortified bridges to prevent inland raids. Nonetheless, the Bretons allied with the Vikings and Robert, the margrave of Neustria, (a march created for defense against the Vikings sailing up the Loire), and Ranulf of Aquitaine died in the Battle of Brissarthe in 865. The Vikings also took advantage of the civil wars which ravaged the Duchy of Aquitaine in the early years of Charles' reign. In the 840s, Pepin II called in the Vikings to aid him against Charles and they settled at the mouth of the Garonne. Two dukes of Gascony, Seguin II and William I, died defending Bordeaux from Viking assaults. A later duke, Sancho Mitarra, even settled some at the mouth of the Adour in an act presaging that of Charles the Simple and the Treaty of Saint-Clair-sur-Epte by which the Vikings were settled in Rouen, creating Normandy as a bulwark against other Vikings. By the mid-ninth century, there were Viking attacks on the coastal Kingdom of Asturias in the far northwest of the peninsula, though historical sources are too meagre to assess how frequent or how early raiding occurred. By the reign of Alfonso III Vikings were stifling the already weak threads of sea communications that tied Galicia (to the rest of Europe. Richard Fletcher, in describing the difficult times in the royal houses on the coast of the Iberian Peninsual,  attests raids on the Galician coast in 844 and 858: "Alfonso III was sufficiently worried by the threat of Viking attack to establish fortified strong points near his coastline, as other rulers were doing elsewhere." In 861, a group of Vikings ransomed the king of Pamplona, whom they had captured the previous year, for 60,000 gold pieces. Raiding continued for the next two centuries. In 968 Bishop Sisnando of Compostela was killed, the monastery of Curtis was sacked, and measures were ordered for the defense of the inland town of Lugo. After Tui was sacked early in the eleventh century, its bishopric remained vacant for the next half-century. Ransom was a motive for abductions: Fletcher instances Amarelo Mestáliz, who was forced to raise money on the security of his land in order to ransom his daughters who had been captured by the Vikings in 1015, in a raid that had lasted nine months. Bishop Cresconio of Compostela (ca. 1036 – 1066) repulsed a Viking foray and built the fortress at Torres do Oeste (Council of Catoira) to protect Compostela from the Atlantic approaches. The city of Póvoa de Varzim in Northern Portugal, then a town, was settled by Vikings around the ninth century and its influence kept strong until very recently, mostly due to the practice of endogamy in the community. In the Islamic south, the first navy of the Emirate was built after the humiliating Viking ascent of the Guadalquivir in 844 when they sacked Seville. Nevertheless, in 859, Danish pirates sailed through the straits of Gibraltar and raided the little Moroccan state of Nekor. The king's harem had to be ransomed back by the emir of Cordoba. These and other raids prompted a shipbuilding program at the dockyards of Seville. The Andalusian navy was thenceforth employed to patrol the Iberian coastline under the caliphs Abd al-Rahman III (912 – 961) and Al-Hakam II (961 – 976). By the next century, piracy from North Africans superseded Viking raids. 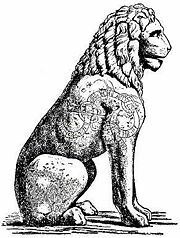 In Athens, Greece, Swedish Vikings wrote a runic inscription on the Piraeus Lion. The Varangians or Varyags (Russian, Ukrainian: Варяги, Varyagi) sometimes referred to as Variagians were Scandinavians who migrated eastwards and southwards through what is now Russia, Belarus and Ukraine mainly in the ninth and tenth centuries. Engaging in trade, piracy and mercenary activities, they roamed the river systems and portages of Gardariki, reaching the Caspian Sea and Constantinople. A number of Arab chroniclers wrote of the exploits of these Northerners, describing their weaponry, their interactions with local populations, and both their battles and trade. One of their goals was to reach Sarkland, possibly a reference to serk the Norse word for silk. Two areas along Greenland's southwest coast were colonized by Norse settlers around 986. The land was marginal at best. The settlers arrived during a warm phase, when short-season crops such as rye and barley could be grown. Sheep and hardy cattle were also raised for food, wool, and hides. Their main export was walrus ivory, which was traded for iron and other goods which could not be produced locally. Greenland became a dependency of the king of Norway in 1261. During the thirteenth century, the population may have reached as high as five thousand, divided between the two main settlements of Austrbygd and Vestrbygd. Greenland had several churches and a cathedral at Gardar. The Catholic diocese of Greenland was subject to the archdiocese of Nidaros. However, many bishops chose to exercise this office from afar. As the years wore on, the climate shifted (qv. little ice age) and elephant ivory from Africa became increasingly available. Crops failed and trade declined. The Greenland colony gradually faded away. By 1450 it had lost contact with Norway and Iceland and disappeared from all but a few Scandinavian legends. Some exploration and expansion occurred still further west, in modern-day North America, with exploration led by Erik the Red and his son, Leif Erikson from Iceland. Eriksson, known from Icelandic sagas as a descendant from a line of Norwegian Viking chieftains, who had established the first European settlement in Greenland in about 985, was most likely the first European discoverer of America in about 1000. Permanent settlements were established in the L'Anse aux Meadows, located in Newfoundland and Labrador, Canada, which has been designated a UNESCO World Heritage Site.\. The Icelandic Vikings called the new found territory "Vinland," after the wild grapes they found growing. Map showing area of Scandinavian settlements during the ninth to tenth centuries. Also the trade and raid routes, often inseparable, are marked. The motives driving the Viking expansion is a much debated topic in Nordic history. One common theory posits that the Viking population had outgrown agricultural potential of their Scandinavian homeland. For a coastal population with superior naval technologies, it made sense to expand overseas in the face of a youth bulge effect. However, this theory does little to explain why the expansion went overseas rather than into the vast, uncultivated forest areas on the interior of the Scandinavian Peninsula. Moreover, no such rise in population or decline in agricultural production has been definitively proven. Another explanation is that the Vikings exploited a moment of weakness in the surrounding regions. For instance, the Danish Vikings were aware of the internal divisions within Charlemagne's empire that began in the 830s and resulted in schism. The Danish expeditions in England also profited from the disunity of the different English kingdoms. The decline in the profitability of old trade routes could also have played a role. Trade between western Europe and the rest of Eurasia suffered a severe blow when the Roman Empire fell in the fifth century. The expansion of Islam in the seventh century had also affected trade with western Europe. Trade on the Mediterranean Sea was historically at its lowest level when the Vikings initiated their expansion. By opening new trade routes in Arabic and Frankish lands, the Vikings profited from international trade by expanding beyond their traditional boundaries. Finally, the destruction of the Frisian fleet by the Franks afforded the Vikings an opportunity to take over their trade markets. Viking expansion could also have originated as a means of resistance to forced Christianization, in particular Charlemagne’s persecutions against all the pagan people, who would have had to accept “conversion, or the massacre." Following a period of thriving trade and settlement, cultural impulses flowed from the rest of Europe to affect Viking dominance. Christianity had an early and growing presence in Scandinavia, and with the rise of centralized authority and the development of more robust coastal defense systems, Viking raids became more risky and less profitable. Snorri Sturluson in the saga of St. Olafr chapter 73, describes the brutal process of Christianization in Norway: “…those who did not give up paganism were banished, with others he (Saint Olafr) cut off their hands or their feet or extirpated their eyes, others he ordered hanged or decapitated, but did not leave unpunished any of those who did not want to serve God (…) he afflicted them with great punishments (…) He gave them clerks and instituted some in the districts.” Clerical pressure by violence since Charlemagne can explain partly the Vikings’ strandhögg targeting of Christian buildings. As the new quasi-feudalilistic system became entrenched in Scandinavian rule, organized opposition sealed the Viking's fate – eleventh century chronicles note Scandinavian attempts to combat the Vikings from the eastern shores of the Baltic Sea, which eventually lead to Danish and Swedish participation in the Baltic crusades during the twelfth and thirteenth centuries, and contributed to the development of the Hanseatic League. Knowledge about arms and armor of the Viking age is based on relatively sparse archaeological finds, pictorial representation, and to some extent on the accounts in the Norse sagas and Norse laws recorded in the thirteenth century. According to custom, all free Norse men were required to own weapons, as well as permitted to carry them at all times. These arms were also indicative of a Viking's social status. A wealthy Viking would have a complete ensemble of a helmet, shield, chainmail shirt, and animal-skin coat, among various other armaments. A less wealthy man, however, could only afford a single weapon, and perhaps a shield. The spear and shield were the most basic armaments of the Viking warrior; most would probably also wear a knife of some description, commonly of the seax type. As an alternative, or perhaps in addition, to the spear a warrior might carry a bow or axe. The wealthiest Vikings would have worn a sword in addition to his primary arms and have had access to body armor, such as a helmet and a mail hauberk. Historical opinion and cultural legacy== In England the Viking Age began dramatically on June 8, 793 when Norsemen destroyed the abbey on the island of Lindisfarne. The devastation of Northumbria's Holy Island shocked and alerted the royal Courts of Europe to the Viking presence. "Never before has such an atrocity been seen," declared the Northumbrian scholar, Alcuin of York. More than any other single event, the attack on Lindisfarne demonized perception of the Vikings for the next twelve centuries. Not until the 1890s did scholars outside Scandinavia begin to seriously reassess the achievements of the Vikings, recognizing their artistry, technological skills and seamanship. The first challenges to anti-Viking sentiments in Britain emerged in the seventeenth century. Pioneering scholarly editions of the Viking Age began to reach a small readership in Britain, archaeologists began to dig up Britain's Viking past, and linguistic enthusiasts started to identify the Viking-Age origins for rural idioms and proverbs. The new dictionaries of the Old Norse language enabled the Victorians to grapple with the primary Icelandic sagas. In Scandinavia, the seventeenth century Danish scholars Thomas Bartholin and Ole Worm, and Olaf Rudbeck of Sweden were the first to set the standard for using runic inscriptions and Icelandic Sagas as historical sources. During the Age of Enlightenment and the Nordic Renaissance, historical scholarship in Scandinavia became more rational and pragmatic, as witnessed by the works of a Danish historian Ludvig Holberg and Swedish historian Olof von Dalin. Until recently, the history of the Viking Age was largely based on Icelandic sagas, the history of the Danes written by Saxo Grammaticus, the Russian Primary Chronicle and the The War of the Irish with the Foreigners. Although few scholars still accept these texts as reliable sources, historians nowadays rely more on archeology and numismatics, disciplines that have made valuable contributions toward understanding the period. Until the nineteenth century reign of Queen Victoria, public perceptions in Britain continued to portray Vikings as violent and bloodthirsty. The chronicles of medieval England had always portrayed them as rapacious 'wolves among sheep'. In 1920, a winged-helmeted Viking was introduced as a radiator cap figure on the new Rover car, marking the start of the cultural rehabilitation of the Vikings in Britain. Norse mythology, sagas and literature tell of Scandinavian culture and religion through tales of heroic and mythological heroes. However, early transmission of this information was primarily oral, and later texts were reliant upon the writings and transcriptions of Christian scholars, including the Icelanders Snorri Sturluson and Sæmundur fróði. Many of these sagas were written in Iceland, and most of them, even if they had no Icelandic provenance, were preserved there after the Middle Ages due to the Icelanders' continued interest in Norse literature and law codes. The 200-year Viking influence on European history is filled with tales of plunder and colonization, and the majority of these chronicles came from western witnesses and their descendants. Less common, though equally relevant, are the Viking chronicles that originated in the east, including the Nestor chronicles, Novgorod chronicles, Ibn Fadlan chronicles, Ibn Ruslan chronicles, and many brief mentions by the Fosio bishop from the first big attack on the Byzantine Empire. Other chroniclers of Viking history include Adam of Bremen, who wrote "There is much gold here (in Zealand), accumulated by piracy. These pirates, which are called wichingi by their own people, and Ascomanni by our own people, pay tribute to the Danish king" in the fourth volume of his Gesta Hammaburgensis Ecclesiae Pontificum, and Egil Skallagrimsson, who mentioned that "Björn was a great traveler; sometimes as Viking, sometimes as tradesman." In 991, the Battle of Maldonbetween Viking raiders and the inhabitants of the town of Maldon in Essex, England was commemorated with a poem of the same namem celebrating the brave Anglo Saxons who were devastatingly defeated by the invaders. Early modern publications, dealing with what we now call Viking culture, appeared in the sixteenth century, e.g. Historia de gentibus septentrionalibus (Olaus Magnus, 1555), and the first edition of the thirteenth century Gesta Danorum of Saxo Grammaticus in 1514. The pace of publication increased during the seventeenth century with Latin translations of the Edda, notably Peder Resen's Edda Islandorum of 1665. The word Viking was popularized, with positive connotations, by Erik Gustaf Geijer in the poem, The Viking, written at the beginning of the nineteenth century. The word was taken to refer to romanticized, idealized naval warriors, who had very little to do with the historical Viking culture. This renewed interest of Romanticism in the Old North had political implications. A myth about a glorious and brave past was needed to give the Swedes the courage to retake Finland, which had been lost in 1809 during the war between Sweden and Russia. The Geatish Society, of which Geijer was a member, popularized this myth to a great extent. Another Swedish author who had great influence on the perception of the Vikings was Esaias Tegnér, member of the Geatish Society, who wrote a modern version of Friðþjófs saga ins frœkna, which became widely popular in the Nordic countries, the United Kingdom and Germany. A focus for early British enthusiasts was George Hicke, who published a Linguarum vett. septentrionalium thesaurus in 1703–1705. During the eighteenth century, British interest and enthusiasm for Iceland and Nordic culture grew dramatically, expressed in English translations as well as original poems, extolling Viking virtues and increased interest in anything Runic that could be found in the Danelaw, rising to a peak during Victorian times. Political organizations of the same tradition, such as the Norwegian fascist party, Nasjonal Samling, used an amount of Viking symbolism combined with Roman symbolism and imagery widely in their propaganda and aesthetical approach. Similar to Wagnerian mythology, the romanticism of the heroic Viking ideal appealed to the Germanic supremacist thinkers of Nazi Germany. Political organizations of the same tradition, such as the Norwegian fascist party, Nasjonal Samling, used Viking symbolism and imagery widely in its propaganda. The Viking legacy had an impact in parts of Europe, especially the Northern Baltic region, but in no way was the Viking experience particular to Germany. However, the Nazis did not claim themselves to be the descendants of any Viking settlers. Instead, they resorted to the historical and ethnic fact that the Vikings were descendants of other Germanic peoples; this fact is supported by the shared ethnic-genetic elements, and cultural and linguistic traits, of the Germans, Anglo-Saxons, and Viking Scandinavians. In particular, all these peoples also had traditions of Germanic paganism and practiced runelore. This common Germanic identity became - and still is - the foundation for much National Socialist iconography. For example, the runic emblem of the SS utilized the sig rune of the Elder Futhark and the youth organization Wiking-Jugend made extensive use of the odal rune. This trend still holds true today (see also fascist symbolism). Since the 1960s, there has been rising enthusiasm for historical reenactment. While the earliest groups had little claim for historical accuracy, the seriousness and accuracy of re-enactors has increased. On July 1, 2007, the reconstructed Viking ship Skuldelev 2, renamed Sea Stallion, began a journey from Roskilde, Denmark to Dublin, Ireland. The remains of that ship and four others were discovered during a 1962 excavation in the Roskilde Fjord. This multi-national experimental archeology project saw 70 crew members sail the ship back to its home in Ireland. Tests of the original wood show that it was made out of Irish trees. The Sea Stallion arrived outside Dublin's Custom House on August 14, 2007. The purpose of the voyage was to test and document the seaworthiness, speed and manoeuvrability of the ship on the rough open sea and in coastal waters with treacherous currents. The crew tested how the long, narrow, flexible hull withstood the tough ocean waves. The expedition also provided valuable new information on Viking longships and society. 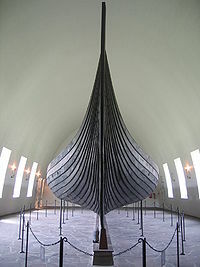 The ship was built using Viking tools, materials and much the same methods as the original ship. Germanic neopagan groups place emphasis on reconstructing the culture and pre-Christian beliefs of the Germanic peoples, including the Viking era of Norse culture. The vast majority number of runic inscriptions from the Viking period come from Sweden, especially from the tenth and eleventh century. Many rune stones in Scandinavia record the names of participants in Viking expeditions, such as the Kjula Runestone which tells of extensive warfare in Western Europe and the Turinge Runestone which tells of a warband in Eastern Europe. Other rune stones mention men who died on Viking expeditions, among these are the 25 Ingvar stones in the this Mälardalen district of Sweden erected to commemorate members of a disastrous expedition into present-day Russia in the early eleventh century. The rune stones are important sources in the study of Norse society and early medieval Scandinavia, not only of the 'Viking' segment of the population. Rune stones attest to voyages to locations, such as Bath, Greece, Khwaresm, Jerusalem, Italy (as Langobardland), London, Serkland (i.e. the Muslim world), England, and various locations in Eastern Europe. In 1931 a railroad brakeman named James Edward Dodd found a broken sword and fragments of an axe and shield near Beardmore, Ontario east of Lake Nipigon. Upon extensive examination, European Norse experts agreed that the relics were authentic Norse weapons. However, Eli Ragout, an acquaintance of "Liar Dodd" (as he was affectionately referred to by his neighbors) later proclaimed that these weapons were planted. According to his tale, he had helped Dodd move from an apartment he was renting, and saw Dodd pack away the artifacts. Dodd had been renting a house owned by J. M. Hanson, who had given a loan to a Norwegian immigrant, and had apparently received these artifacts as collateral. Similarly, an artifact called the Kensington Runestonewas unearthed in 1898 by a Norwegian-American farmer in West-Central Minnesota. Now residing in a Minnesota Museum, the stone carries an inscription that depicts an attack on a party of Geats and Norwegians that took place in 1362. The inscription translates roughly to: "Eight Swedes and twenty-two Norwegians on an exploration journey from Vinland westward. We had our camp by two rocky islets one day's journey north of this stone. We were out fishing one day. When we came home we found ten men red with blood and dead. AVM save us from evil. We have ten men by the sea to look after our ships, fourteen days journey from this island. Year 1362." The authenticity of this artifact is in dispute. Although some of the runes were very old, some were modern, with several phrases dating back to the nineteenth century, and with grammar that wasn't common until well after the 1300s. The Vikings’ prolific expansion is still exhibited in modern genetics. Relatively high frequencies of Haplogroup R1a1 are found in Northern Europe, the largest being 23% in Iceland, and it is believed to have been spread across Europe by the Indo-Europeans and later migrations of Vikings, which accounts for the existence of it in, among other places, the British Isles. Despite images of Viking marauders who live for plunder and warfare, the heart of Viking society was reciprocity, on both a personal, social level, and on a broader political level. The Vikings lived in a time when numerous societies were engaged in many violent acts, and the doings of the Vikings put into context are not as savage as they seem. Others of the time period were much more savage than the Vikings, such as the Frankish king, Charlemagne, who cut off the heads of 4,500 Saxons for practicing paganism (Bloody Verdict of Verden) in one day. Most Vikings were traders, although some did plunder, often monasteries around Ireland, Scotland, Wales, and England, as they had a lot of valuables in gold and silver. As monasteries were centers of learning and writing, their experiences were much more likely to enter the historical record. However, considerable literature in the monasteries would have been destroyed during the plunderings. One of the Vikings' largest profit-centers was the slave trade; any group that acts as slave-takers is likely to be viewed with disdain by their victims. During the period of the Vikings, slavery was common throughout Northern Europe, and the fact that many slaves were captured persons was irrelevant in law. A person from Poland could be captured and later sold in England, for example. Slavery was common amongst the Scandinavians themselves, as well. In the 300-year period where Vikings were most active, there were approximately 347 recorded attacks that spread from the British Isles to Morocco, Portugal, and Turkey. In Ireland, where the Vikings are most famous for attacking monasteries, there were 430 known attacks during this 300-year period. The use of human skulls as drinking vessels is also ahistorical. The rise of this myth can be traced back to a Ole Worm's Runer seu Danica literatura antiquissima of 1636), warriors drinking ór bjúgviðum hausa [from the curved branches of skulls, i.e. from horns] were rendered as drinking ex craniis eorum quos ceciderunt [from the skulls of those whom they had slain]. The skull-cup allegation may also have some history in relation with other Germanic tribes and Eurasian nomads, such as the Scythians and Pechenegs. Spearheaded by the operas of German composer Richard Wagner such as Der Ring des Nibelungen, Vikings and the Romanticist Viking Revival have inspired many works of fiction, from historical novels directly based on historical events like Frans Gunnar Bengtsson's The Long Ships (which was also filmed) to extremely loosely based historical fantasies such as the film The Vikings, Michael Crichton's Eaters of the Dead (movie version called The 13th Warrior) and the comedy film Erik the Viking. Modern influence is also exhibited in the genre of Viking metal. A popular sub-genre of heavy metal music, originating in the early 1990s as an off-shoot of the black metal sub-genre. This style is notable for its lyrical and theatrical emphasis on Norse mythology as well as Viking lifestyles and beliefs. Popular bands that contribute to this genre include Einherjer, Valhalla, Týr, Amon Amarth, Ensiferum and Enslaved. ↑ Eelia Goldsmith, "The etymology of 'Viking'," Viking Times magazine (February 2004), The etymology of “Viking”. Retrieved November 14, 2007. ↑ Jan Terje Faarlund. The Syntax of Old Norse. (New York: Oxford University Press, 2008. ISBN 0199235597), 25. ↑ Frans Gunnar Bengtsson. The Long Ships: A Saga of the Viking Age. (London: Collins, 1954), 139. ↑ Kazmer Ujvarosy, The Sceaf (Sheaf) Legend Indicates the Viking – Vihk, ’Sheaf’, Etymology Academic.edu. Retrieved October 6, 2014. ↑ Sverrir Jakobsson,, Hvaðan komu víkingarnir og hvaða áhrif höfðu þeir í öðrum löndum? The University of Iceland Science (in Icelandic) Retrieved December 17, 2007. ↑ School of Avaldsnes, Olav Trygvassons saga (in Icelandic) Retrieved December 17, 2007. ↑ Snorre Sturlason. Heimskringla Or the Lives of the Norse Kings. (original 1932) (reprint ed. Whitefish, MT: Kessinger Publishing, 2004. ISBN 0766186938) Heimskringla Retrieved December 17, 2007. ↑ I.A. Langmoen, (Abstract)The Norse discovery of America Pubmed.gov. from Neurosurgery (Dec 2005) 57(6):1076-1087 Retrieved December 17, 2007. ↑ "Birth of a Nation: King Kenneth McAlpine",.BBC history. Retrieved November 18, 2008. ↑ Viking Network Ireland. A History of Viking Dublin. A History of Viking Dublin Retrieved November 14, 2007. ↑ Richard Fletcher, 1984, Saint James's Catapult: The Life and Times of Diego Gelmírez of Santiago de Compostela. Chapter 1, libro.ucla. Retrieved November 18, 2008. ↑ "Vikings in the East-Remarkable Eyewitness Accounts."nordicway.com. ↑ John Noble Wilford, "Ancient Site in Newfoundland Offers Clues to Vikings in America".New York Times, May 9, 2000, Retrieved November 18, 2008. ↑ Eric Christiansen. The Northern Crusades, 2nd ed. (New York: Penguin, 1998. ISBN 0140266534), 93. ↑ Alan Palmer. Northern Shores. (London: Murray John Publishers, 2006. ISBN 0719562996), 21. ↑ Andrew Wawn, "The Viking Revival." at BBC Retrieved December 17, 2007. ↑ of Malden.Retrieved November 10, 2008. ↑ Sea Stallion, Return of Dublin's Viking Warship, Return of Dublin's Viking Warship Retrieved November 14, 2007. ↑ baþum (Sm101), see Lena Peterson. Nordiskt runnamnslexikon. Nordiskt runnamnslexikon PDF Retrieved December 17, 2007. ↑ In the nominative: krikiaR (G216). In the genitive: girkha (U922$), k—ika (U104). In the dative: girkium (U1087†), kirikium (SöFv1954;20, U73, U140), ki(r)k(i)(u)(m) (Ög94$), kirkum (U136), krikium (Sö163, U431), krikum (Ög81A, Ög81B, Sö85, Sö165, Vg178, U201, U518), kri(k)um (U792), krikum (Sm46†, U446†), krkum (U358), kr… (Sö345$A), kRkum (Sö82). In the accusative: kriki (Sö170). Uncertain case krik (U1016$Q). Greece also appears as griklanti (U112B), kriklati (U540), kriklontr (U374$), see Peterson. ↑ Karusm (Vs1), see Peterson. ↑ iaursaliR (G216), iursala (U605†), iursalir (U136G216, U605, U136), see Peterson. ↑ lakbarþilanti (SöFv1954;22), see Peterson. ↑ luntunum (DR337$B), see Peterson. ↑ serklat (G216), se(r)kl… (Sö279), sirklanti (Sö131), sirk:lan:ti (Sö179), sirk*la(t)… (Sö281), srklant- (U785), skalat- (U439), see Peterson. ↑ eklans (Vs18$), eklans (Sö83†), ekla-s (Vs5), enklans (Sö55), iklans (Sö207), iklanþs (U539C), ailati (Ög104), aklati (Sö166), akla—(U616$), anklanti (U194), eg×loti (U812), eklanti (Sö46, Sm27), eklati (ÖgFv1950;341, Sm5C, Vs9), enklanti (DR6C), haklati (Sm101), iklanti (Vg20), iklati (Sm77), ikla-ti (Gs8), i…-ti (Sm104), ok*lanti (Vg187), oklati (Sö160), onklanti (U241), onklati (U344), -klanti (Sm29$), iklot (N184), see Peterson. ↑ TIME, "Old Norse," October 24, 1938, Old Norse Retrieved December 17, 2007. ↑ Edmund Carpenter, "Further evidence on the Beardmore relics," American Anthropologist 59 (5) (October 1957): 875-878, Online at JSTOR Retrieved December 17, 2007. ↑ North American Rune Stones,sunnyway. Retrieved November 18, 2008. ↑ Bill Hoyt, Kensington Runestone FAQ, Question 7: What was the "Holy Mission"? Retrieved November 14, 2007. ↑ Ancestry.com community, Y Haplogroup R1a1, Y Haplogroup R1a1 Retrieved November 14, 2007. Bengtsson, Frans Gunnar. The Long Ships: A Saga of the Viking Age. London: Collins, 1954. Carpenter, Edmund. "Further evidence on the Beardmore relics." American Anthropologist 59 5 (October 1957): 875-878. Online at JSTOR Retrieved December 17, 2007. The Generations Network. "Y Haplogroup R1a1" Retrieved November 14, 2007. Goldsmith, Eelia. The etymology of “Viking” Viking Times magazine, February 2004. Retrieved November 14, 2007. Graham-Campbell, James (ed.). Cultural Atlas of the Viking World. New York: Facts on File, 1994. Jakobsson, Sverrir. Hvaðan komu víkingarnir og hvaða áhrif höfðu þeir í öðrum löndum?. The University of Iceland Science (In Icelandic ) Retrieved December 17, 2007. Karlsson, Gunnar. "Er rökrétt að fullyrða að landnámsmenn á Íslandi hafi verið víkingar?" The University of Iceland Science (in Icelandic) Retrieved December 17, 2007. Karlsson, Gunnar. "Hver voru helstu vopn víkinga og hvernig voru þau gerð? Voru þeir mjög bardagaglaðir?" The University of Iceland Science (In Icelandic) Retrieved December 17, 2007. Peterson, Lena. Nordiskt runnamnslexikon PDF Retrieved December 17, 2007. Pubmed.gov. "The Norse discovery of America" Retrieved December 17, 2007. Sawyer, Peter Hayes. The Oxford Illustrated History of the Vikings. New York: Oxford University Press, 1997. School of Avaldsnes. Olav Trygvassons saga (in Icelandic) Retrieved December 17, 2007. Sea Stallion. Return of Dublin's Viking Warship Retrieved November 14, 2007. The Straight Dope. "Did Vikings really wear horns on their helmets?" Retrieved November 14, 2007. TIME, "Old Norse" October 24, 1938. Retrieved December 17, 2007. Viking Network Ireland. A History of Viking Dublin Retrieved November 14, 2007. Wawn, Andrew. The Viking Revival. at BBC. Retrieved December 17, 2007. Williams, Gareth. How do we about the Vikings? at BBC. Retrieved November 14, 2007. All links retrieved February 10, 2015. Reassessing what we collect website – Viking and Danish London History of Viking and Danish London with objects and images.